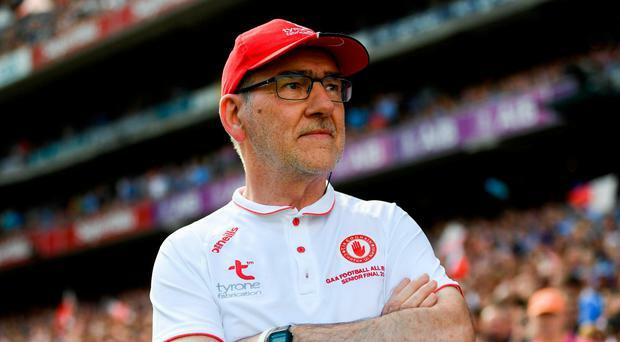 Mickey Harte's unforgivable error was not to dump Tyrone's zonal defensive system after last year's semi-final. Stubbornness can be a virtue but not when it flies in the face of logic. Failing to learn the lessons from that day puts him into the category of climate change deniers. My son and some of his schoolmates were giving a concert in Belfast during the week when Prince Charles dropped in, something that wouldn't have happened in my day. I arrived into the hall on Saturday for the Foreglen's gala night and bumped into Gerry Donnelly. I was chatting with two old fellows from the Moy after the final whistle in the Ulster intermediate club final last Sunday. Slaughtneil Robert Emmets held their gala dinner last Saturday night. There were over 800 people there. "It's like the Third Reich," said Gerry Donnelly. "Get f***ed into them lads, f***ed into them." The man beside me in the main stand at Queen's playing fields is shouting and waving his fists. With two minutes to go and Kerry a point up, it looked as if another movement was to be added to Mayo's symphony of sorrowful songs. Joe Brolly: Diarmuid Connolly was compared to a violent animal on national television, how could Jim not be enraged? If you are not familiar with tyronetribulations.com ('News from among the bushes') then you should be. It is a blog full of angst over the travails of Tyrone footballers since 2008. The CCCC is the GAA's prosecution service. I call them 'Parking Pataweyo'. Two dives last weekend. Two more Premier League penalties. On Easter Sunday, I was a judge at the Knockmore club’s ‘Stars In Your Eyes’ as 750 people crammed into the Hotel Ballina for a night of hilarity. We'll start this week with a little quiz: 1. Which GAA leader said this to the Irish Independent in November 2015? "We have taken a decision that we do not want any more inter-county games.